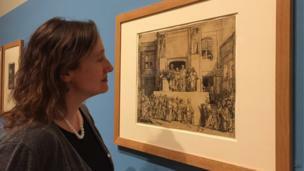 A museum displays its Rembrandt etchings together for the first time in 30 years. 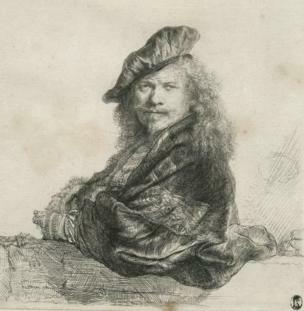 Etchings by Rembrandt (pictured in a self portrait from 1639) are going on display in one place - at the Norwich Castle Museum - for the first time in three decades. 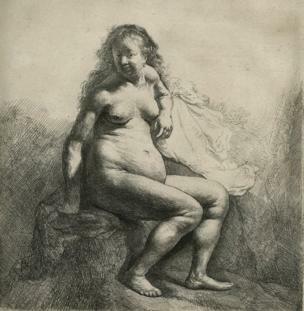 The exhibition, called Rembrandt: Lightening the Dark, runs 21 October 2017 to 7 January 2018, and also includes Naked Woman Seated on a Mound from 1631. 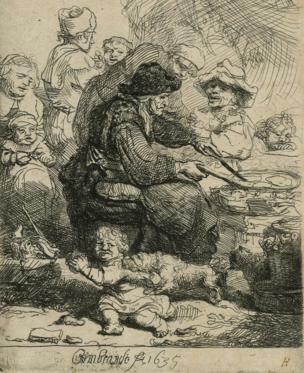 Joint curator of the exhibition, Dr Francesca Vanke, said: "This is the first time Norwich Castle’s extraordinary collection of etchings by Rembrandt [including The Pancake Woman, pictured] has been exhibited as a group for more than 30 years. 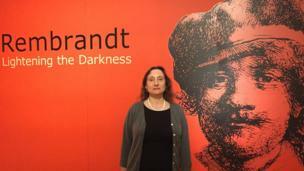 The exhibition demonstrates how Rembrandt’s handling of light and darkness, expressed purely through the medium of black lines and the white space around them, was unsurpassed." 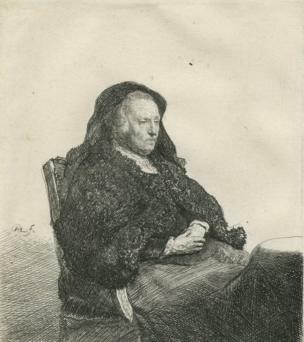 Dr Vanke said: "Some of the etchings have been shown individually, but the reason they haven't been shown together is mainly because they're on paper and are very sensitive to light. It's a conservation issue." Dr Vanke said: "This is a rare chance to see them together, but once the exhibition finishes they'll go back into storage, although you can see them in our catalogue and on the museum's website." 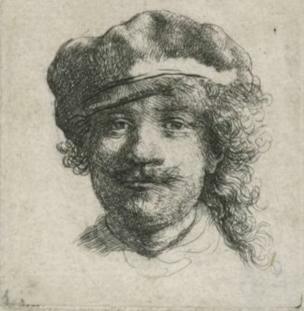 Born in Leidon in The Netherlands in 1606 he was christened Rembrandt Harmensz van Rijn - pictured in a self portrait wearing a soft cap, etched on paper in 1634. 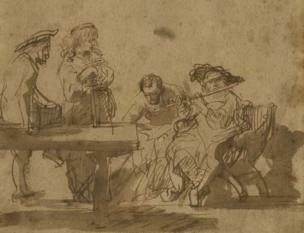 Rembrandt's works depict a wide variety of subjects from landscapes to portraits to street scenes such as Group of Musicians Listening to a Flute Player (pictured) - drawn with brown ink and wash on paper in 1635. The exhibition also features this picture borrowed from the British Museum. 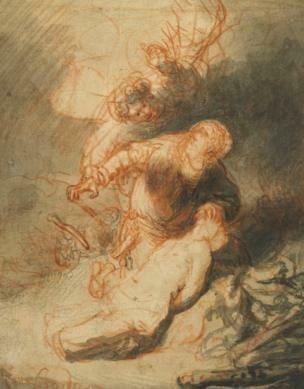 It is a red chalk over black chalk drawing of the Old Testament story of the Angel preventing Abraham from sacrificing his son Isaac. It dates from the 1630s. 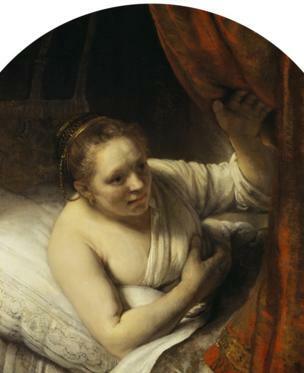 The National Galleries Scotland has also lent a picture - an oil on canvas called A Woman in Bed, which dates from the late 1640s.